Kevin Altomare, Chef and Co-Owner of Hudson's Restaurant & Catering Chef Kevin got his start in the culinary industry at an early age, standing on milk crates to wash dishes in his father's restaurants. Ultimately, Kevin decided to pursue his passion and attend the Culinary Institute of America in Hyde Park, New York. He graduated in April 2005 alongside his brother “J.J.". Their father, John Altomare, delivered the commencement speech. During his studies, Kevin interned at The Ritz-Carlton, Grande Lakes. Kevin spent time at K-Paul's Louisiana Kitchen in New Orleans and worked under famed Chef Paul Prudhomme and Chef Paul Miller. He left K-Paul’s just a month before Hurricane Katrina devastated much of New Orleans. Kevin then became a manager at a prominent seafood restaurant. John "J.J." Altomare, Chef and Co-Owner of Hudson's Restaurant & Catering Chef "J.J." attributes his passion for the culinary industry to his youngest years spent helping out in his father's restaurants. Named after his father and grandfather – J.J. always had a feeling he would follow in their footsteps. In a true family affair, J.J. attended the Culinary Institute of America in Hyde Park, New York with his brother Kevin. During his studies, J.J. interned at Primo in the JW Marriott, Grande Lakes Resort, training with Melissa Kelly – the 1999 James Beard award-winning chef. Under Kelly, J.J. developed an enthusiasm and appreciation for using organic and locally-grown produce. Following graduation, J.J. explored his creative side at a new hotel concept where he prepared high-end, nutritious and delicious food for children and adults. 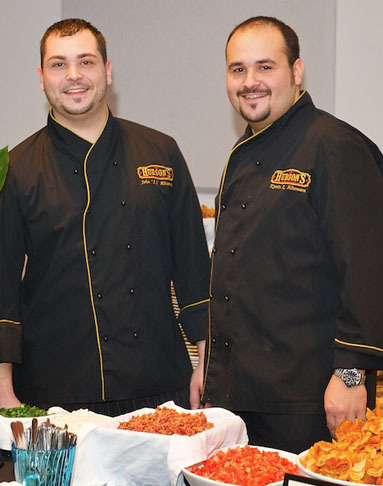 In 2006, the Altomare brothers returned to Hudson, Ohio, a place they once called home, to embark on a dream they always held of once again working together alongside their father. Their dream became a reality in October of 2006 when the doors of Hudson's Restaurant opened for the first time, creating a new Hudson landmark. Their hope is that one day history may repeat itself by J.J.'s son, John Altomare IV, washing dishes on a milk crate – just the way his father and uncle got started in the family business.